Mission: Homemaker: Is it a job? I went down a comment thread rabbit hole on a Facebook post today. One of the commenters made the statement that being a SAHM was not a job, because a job is a means to an end. With a job someday you will be done, you will retire, but you will never stop being a parent. We will never stop mothering. This is in no way an attempt to start any argument or discussion about WOHMs vs SAHMs, or any other version of Mommy Wars. Just my disclaimer. I am completely content in what my husband and I have chosen as the best path for our family. I am a homemaker, I have no issues telling people that, and I do not feel the need to justify it in any way. However, it is not a job. Being a mother is not a job, it is so much more. We really denegrate our status as mothers when we call it a job. It is a calling, a passion, a lifelong persuit and process! We will never stop trying to mother our babies, even when they leave home and have babies of their own. We are adaptable people, we mothers. We will find ways to mother our children no matter what their ages! 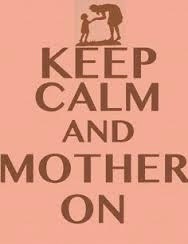 So mother on, ladies! Mother on. Wife, Mother, homemaker, farmer(ish), and God fearing woman living in Heaven on Earth.